Coding efficiency is an important measure of burst-mode RF transmitters. In our recent publication  we have proposed an aliasing-free PWM (AFPWM) method which can avoid all destructive aliasing distortion due to the sampling process when the PWM process is performed in digital domain. A side effect of AFPWM method is that it induces amplitude variations onto the amplitude of the generated PWM signals. On the one hand, the non-ideal switching amplitude can cause nonlinear distortion due to the clipping effect, where a possible way to minimize the ripple is to choose an appropriate number of harmonics in the generated PWM signals. On the other hand, with the AFPWM method, the PA is operated over a slightly wider range of output power regions instead of operating at saturation and in cut-off, resulting in a reduced RF PA efficiency. In this work , we show that the AFPWM method does not degrade the overall transmitter efficiency compared to the conventional comparator-based PWM due to a higher coding efficiency. Concerning the efficiency, the average transmitter efficiency is higher with smaller numbers of harmonics K. Therefore, it is desirable to keep K as small as possible to achieve a high average transmitter efficiency. When it comes to the linearity, smaller K leads to a degradation of linearity. Consequently, it is also desirable to keep K as large as possible to obtain a good linearity. Note that K should be small enough to prevent aliasing distortion caused by the digital PWM process. 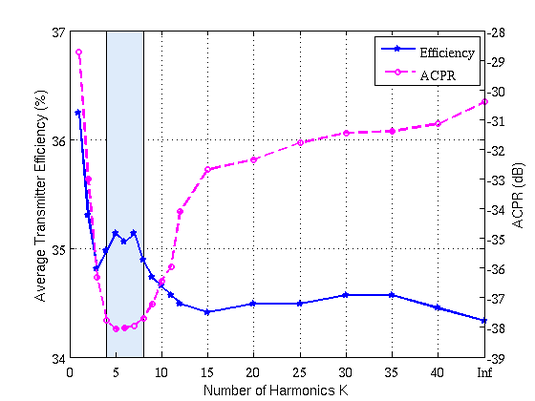 To illustrate this efficiency-linearity trade-off, the figure depicts the measured average transmitter efficiency as well as the measured ACPR for different K. As can be observed from the figure, the number of harmonics can be chosen between K=[4,8] (blue area) to provide a high efficiency as well as a satisfying linearity for the used measurement setup. Hausmair, K.; Shuli Chi; Singerl, P.; Vogel, C., "Aliasing-Free Digital Pulse-Width Modulation for Burst-Mode RF Transmitters," Circuits and Systems I: Regular Papers, IEEE Transactions on, vol.60, no.2, pp.415,427, Feb. 2013. Shuli Chi; Hausmair, K.; Vogel, C., "Coding efficiency of bandlimited PWM based burst-mode RF transmitters," Circuits and Systems (ISCAS), 2013 IEEE International Symposium on , vol., no., pp.2263,2266, 19-23 May 2013.